Emma Rice's Brief Encounter was first staged over ten years ago and has been acclaimed in its travels since then. It returns to the Art Deco Empire cinema, in Haymarket, London for a season until 2nd September. When it first appeared it was an imaginative unique combination of a cinematic and theatrical experience but since then we have seen the development of Secret Cinema as an annual event in London, which makes this combination so brilliantly immersive, and the broadcast of live theatre to cinemas all around the country. There is a logic to the use of the Empire cinema which has been dressed for the show in red carpet and roses and fits as a venue that Laura and Alec might have visited in their illicit afternoon meetings. However, the long stairs up to the auditorium or down to the toilets makes the venue less accessible and makes it less than ideal for the older audience who this title might appeal to. 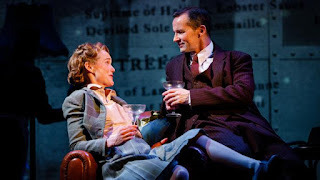 The production draws on the original brilliant David Lean black and white film of the same title about the unrequited love between two married people who meet on a railway station and on a short one act play by Noel Coward, Still Life . It adds in a selection of Noel Coward written songs including "A room with a view" and "Mad about the boy" written in the thirties. 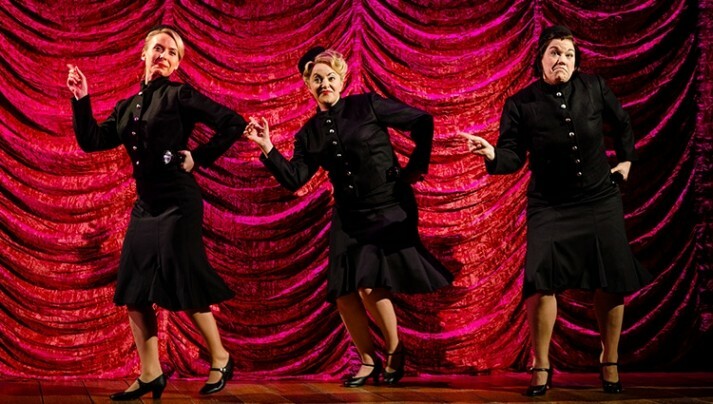 It weaves these together in a Variety show format, with song and dance routines presented in front of glamorous red drapes, some projected film scenes downstage which live action interact with and full stage scenes set in the station cafe or Laura's marital home. 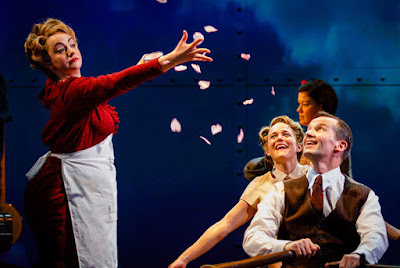 It is fast moving and entertaining but a little unsatisfactory as the magic of the staging is fully on show and does not feel as romantic as the original film. niceness and courtesy tempts Laura. Dean Nolan has the most fun playing the dull husband, Fred and the station porter Albert and is at his comic best in his pursuit of Myrtle (Lucy Thackeray) the cafe manager. 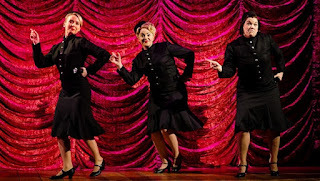 There is a third romance between the hilarious Beverly Rudd as Beryl, the waitress and Stanley (Jos Slovick) as her love interest who also gets to deliver some of the best songs. This is show packed with imaginative creative visual ideas in its staging and a clear sense of its own style and identity. It makes you yearn to see the original film again but offers an amusing and entertaining night.